This should work with the right LanguageTargets, shouldn't it? For me it works good with VS2017 RC and the class library project (.NET Framework, not .NET Standard). I can include XAML files and everything is properly compiled, Intellisense works, etc. UPD. I also checked default class library project (the template with .NET Standard). After switching target to net461 it works but indeed it treats XAML as None... and manual setting it to Page leads to The target "CoreCompile" does not exist in the project error. I was able to properly setup XAML files building with CPS for VS2017. @onovotny was right, with proper targets it works. I've added <Import Project="$(MSBuildToolsPath)\Microsoft.CSharp.targets" />. Also I added missing XAML rule for Page. And I've found a workaround for the issue with the dependent .xaml.cs files for files globbing (see link above). Ok. I now understand this much better (@srivatsn). WPF (and some other project types) generate a temporary project file that does not use the same extension as the original (WPF uses .tmp_proj, for example). The SDK.targets uses the project extension to set LanguageTargets (provided LanguageTargets has not already been set). It then imports whatever LanguageTargets is set to (C# should be setting it to $(MSBuildToolsPath)\Microsoft.CSharp.targets, for example). So the workaround is to ensure that LanguageTargets is set on any project type that hits the above issue. I would think the proper fix, however, is to get the XAML targets (and any other targets that generate temporary projects) to use the original project extension. @tannergooding, WPF is using temporary project because it need two-pass building to properly process XAML markup as described in this article on MSDN. So I'm afraid it might not be possible to avoid .tmp_proj. @aienabled Keep any bugs you file for managed concepts on this repro. @aienabled, i wasn't indicating it should avoid .tmp_proj, I'm saying t should usee the original projects file extension when doing so. Meaning instead of .tmp_proj, it should use .tmp_proj.csproj or just .csproj. @tannergooding can you file that as an internal bug on XAML? @srivatsn, I have logged VSO Bug: 382095 (not sure if the area path is correct, it seemed to be the best fit though). 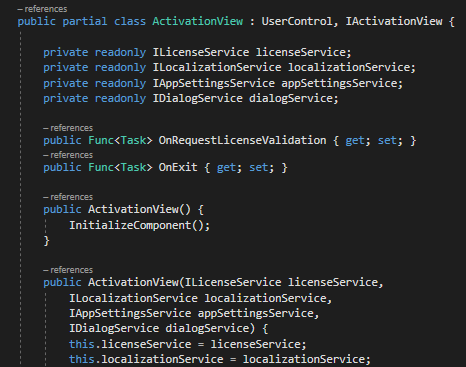 XAML needs PresentationBuildTasks, right, so is it correct that making this work in the SDK won't automatically make it work with dotnet build? Turns out the XAML build sets the AssemblyName property to the original value. Anyone got this working? I'm able to compile it but I lost intellisense in VS 2017. ❓ @bdovaz I notice you have Generator="MSBuild:UpdateDesignTimeXaml". Is there a reason you aren't using Generator="MSBuild:Compile"? Here's one project that I've been working on that uses XAML. I need to look back and see if IntelliSense is working properly. @sharwell to be honest I don't know, my csproj is being written by seeing other people examples that are trying to achieve the same goal. Note: The code that is not recognizing it's in another referenced project. Successfully includes XAML intermediate code (*.g.cs) so I can reference components of the XAML page. I've tried to update my csproj seeing that example but I have the same problem: it compiles but I have no Intellisense. I'm using it successfully for WPF (multiple projects referencing each other) and IntelliSense works well (in C# and XAML files). Do you need this for WPF/UWP or Xamarin project? Are you able to see XAML files in the solution explorer? I'm asking because there is no Page item type rule in netstandard and without it XAML files added as Page are not visible in the solution explorer but you didn't mention about it. To workaround this, I'm using custom targets which add the Page rule. I will prepare a small sample. @tannergooding We've been working on our WPF application for several years and are still creating new ones. We (can't speak for others...) would prefer, by far, a breaking change than not having CPS support. A breaking change we can deal with. We notice it, we learn about it, we apply the changes and we move on. The split between CPS and old style projects has already created issues for us several times as we've also got .net core frontends. Using CPS everywhere would enable us to share more of our build chain and make our build chain/infrastructure simpler, too. Currently we have to duplicate quite some code and that creates continuous friction - much worse than a breaking change. That said, however, we'd also be fine with CPS WPF support being an opt-in. Let's say you could add a *.targets import to every WPF csproj or something like that. I'm in exactly the same position - tons of old wpf, tons of new asp.net core, we want interoperability and can accept breaking changes to achieve it, whether they require an opt-in or not. Same here, If we have that breaking changes documented, there is no problem. @sharwell the last bit of that .csproj file in the link you referenced, it will break loading of the Assemblies. Doesn't work! I am using v4.7.1 w/ CPS build configs. @everyone as for the expected abstract target for CoreCompile, Adding the target Imports for old conventions do not work for me. It is very problematic and doesn't appear to be correct anyway. I recommend using a pseudo target to get around it asking for the built-in default target for now. @Latency Can you be more specific? The code you referenced as broken is currently used in several projects, including Roslyn where I spend the most time. We have observed a few rare edge cases where things don't work right, but generally that appears to be a required inclusion. @sharwell I managed to get something to work within the past 24 hrs.. but it does not contain that target rule like mentioned in my previous thread. That target breaks my project. The <LanguageTargets ...> seems to be a key component to getting this to work, along with using the appropriate referenced assemblies to be included for XAML. It makes it compile on my machine, maybe it helps you, too. @Latency I would strongly suggest you use my MSBuild.Sdk.Extras package instead of adding that code to your own project. I have the WPF workarounds/"stuff" in there based on @sharwell and others' work. If there's other issues/enhancements, I'm happy to take PR's to fix. My objective with that package is to fill the box and make it clean/simple to use with SDK style projects until there's direct support from Microsoft. @sharwell I'll give you the same advice too for ILSpy ;) Iet's keep our efforts/workarounds consolidated if we can. @onovotny I will be happy to give that a try.. It looks solid! To be clear, I am removing the entire <ItemGroup> section and the <LanguageTargets> line also as shown in my snip-it with this? On initial compile.. it appears to pass the pre-checks. Since, my project is broke down for reconstruction on a major build ATM, I have lots of debugging to do.. and can not validate this! What I can tell you is that something is missing from being able to compile the XAML files now after using your .nupkg. I am getting missing references to override OnClosing() in a few of my XAML files and about 100 less errors than my version which seems suspicious. I am not sure what order the compiler is checking things here. Q: I assume that I would need to resolve these OnClosing() issues before seeing the other 100 problems with the project that still remain to be debugged? I have had to revert to keeping the rules from my above listed example to finish debugging my project until I can get a more clarity on which rules I must keep in conjunction with your Extensions package. Q: Is the Workaround .nupkg of yours deprecated and been replaced with the Extensions one now? Q: For Blend 2017, it appears it is not supporting the new build configuration formats. Any thoughts regarding that? Are we supposed to wait for a fix from Microsoft on this? Tried to convert a XAML project to the new project format today and neither the LanguageTargets nor the MSBuild.Sdk.Extras worked although I also use the latest SDK. Given that .Net Core 3.0 is going to come soon, when are we going to see support for this? There is imperfect XAML support already in the 3.0 nightly builds - pre-alpha stuff, but it’s definutely being implemented. I would expect full support (designer etc) to require vs2019. In the meantime, the workarounds people have described above are still functioning; I have a bunch of WPF libraries and applications using SDK projects. Project system support, as per our roadmap https://github.com/dotnet/project-system/blob/master/docs/repo/roadmap.md, is in the 16.x timeframe.